Are you new to the area? Maybe it has been a while since you have last visited the dentist? No matter the reason, you are now looking for a new dentist in Annapolis. While there are many great options in the area, not all will be right for you. You have unique oral health needs, which constantly change over the years. Plus, you have certain expectations when it comes to your dental care. As a result, it can be difficult finding the perfect dental practice to meet your needs. To make your search easier, there are 5 important things to consider when choosing a new dentist. As time goes on, you will require more than just a cleaning and checkup to maintain your oral health. You will need a diversity of services to keep your teeth and gums healthy. To ensure that all your needs can be met in-office, choose a dentist who offers extensive services under one roof. In addition to preventive and restorative care, choose a location that offers areas of specialty as well, like cosmetic dentistry, periodontal therapy, and dental implants. It is also best to choose a dentist who embraces the latest technological advancements while also offering comfort amenities, like sedation dentistry. To benefit from high-quality care that you can trust, research the qualifications and experience of the dentist you are considering. 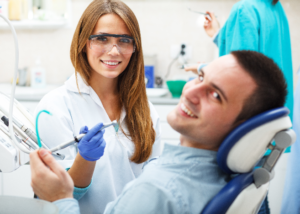 In addition to their dental degree, look for one who has received additional training and regularly continues their education to remain well-versed in the latest dental methods and techniques. Now, you can find everything online, including reviews and testimonials about a dental practice. Take the time to research the dentist to read online reviews from past and current patients. This will provide you with first-hand information regarding the care and services you can expect to receive from that location. All too often, people must put their dental appointments on hold due to finances. You do not want the cost of care to stand in your way of achieving a healthy smile. Choose a dentist who works with your insurance company to keep care affordable. In addition, look for one who accepts an array of payment methods while offering financing opportunities, like CareCredit. Your schedule is busy. You need a dentist who offers flexible office hours and a convenient location to make scheduling appointments easy. Choose a dentist who can accommodate your busy day, so you do not have to miss work or put your dental needs on hold due to schedule conflictions. If you need a new dentist, do not pick just any one. Take the time to research your options to make a wise choice for your smile. Chambers Family Dentistry is committed to providing a unique dental experience for each patient. We provide high-quality care that caters to your needs to help you reach and maintain your oral health. If you need a new dentist, choose a location you can trust. Contact our office today to schedule your first appointment.